As always, we are going to place the call of our new subroutine, called SET_AGGREGATIONS in the usual INITIALIZE_ALV subroutine. In the implementation of the SET_AGGREGATION subroutine, we are going to get an object reference of the CL_SALV_AGGREGATIONS, using the GET_AGGREGATION() method of our ALV object (CL_SALV_TABLE object), and save the returning object reference into a reference variable, called AGGREGATIONS that has the type CL_SALV_AGGREGATIONS. DATA aggregations TYPE REF TO cl_salv_aggregations. In the next few lines, we are going to construct a TRY-CATCH block that is responsible to catch the following three exceptions: CX_SALV_DATA_ERROR, CX_SALV_NO_FOUND and CX_SALV_EXISTING. In the core of the TRY-CATCH block, we call the ADD_AGGREGATION() method of the previously initialized reference variable, called AGGREGATION. The method requires two importing parameters, a column name that we want to aggregate, and an aggregation type. Although the SPFLI table is not the best for demonstrating the aggregations, but there are some columns that we can use, like the FLTIME, namely Flight Time. As a last step, we set the location of the aggregation row to display before the items, via the SET_AGGREGATION_BEFORE_ITEMS() method. That's it! It wasn't too complicated, was it? DATA display_settings TYPE REF TO cl_salv_display_settings. As a result, we got our aggregation row, highlighted with yellow color at the top of the flight schedule items, indicating the maximum of the flight times. Alright, that was my CL_SALV_TABLE tutorial series. Using these code snippets and source codes, you are able to construct decorated, and feature-rich ALV lists about less than 30 minutes with readable and transparent source code. 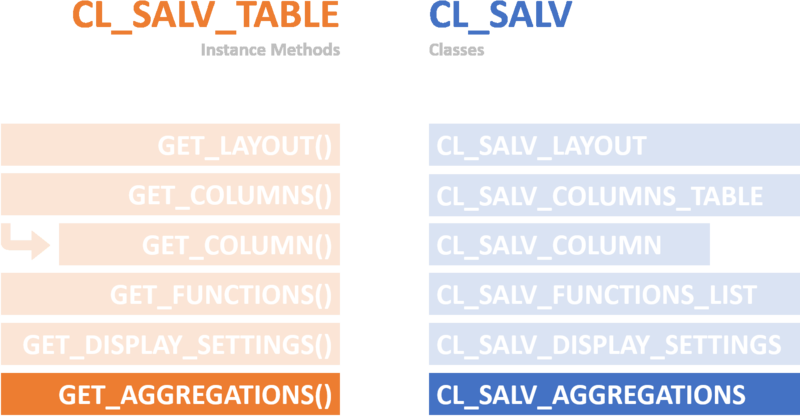 I know that I haven't showed you everything about CL_SALV_TABLE, but we have touched the most common settings, and based on this knowledge, I know that you can easily enable other settings as well. That's all! Stay tuned, I keep posting!